I honestly never expected a movie about one-on-one interviews with President Richard Nixon to be this exceptionally riveting. But, "Frost/Nixon" is absolutely enthralling, and I was drawn in entirely. You know you're witnessing something superb when history jumps off the screen at you like that with scalding dramatic force. Yes, some aspects of the film are fictionalized, but that doesn't take away from any of the historic accuracy. It simply adds to it, creating even more stirring involvement. We are invited to look deep into these two men who face off against each other in a battle of sheer will and bravery. It's captivating stuff, and comes together remarkably in no small part thanks to the screenplay by Peter Morgan, who also wrote the Academy Award nominated "The Queen," and fine direction by Ron Howard. 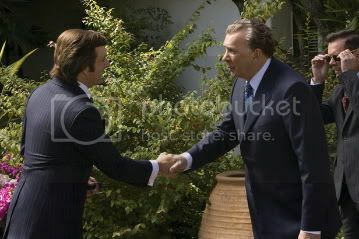 The movie is based on Morgan's play of the same name, and it tells the story of David Frost's (Michael Sheen) 1977 series of interviews with President Nixon (Frank Langella) following his resignation in 1974. Early scenes in the movie show Frost as a charismatic, easygoing, very well-liked TV show host who also doesn't have any trouble picking up a woman on an airplane. His sudden interest in Nixon's resignation and his proposition to interview him at first isn't taken seriously. In time, however, Frost receives a call from Nixon's agent, Swifty Lazar (Toby Jones), who says that the ex-President isn't entirely opposed to the idea of an interview. They figure Frost is a pushover and it would be quick, easy money. Frost ends up paying $600,000 of mostly his own money because the network stations have no faith in him. Frost then quickly compiles a team including a TV newsman named Bob Zelnick (Oliver Platt), a researcher named James Reston, Jr. (Sam Rockwell), and his producer, John Birt (Matthew MacFayden). They keep reminding Frost to keep on top of Nixon, keep interrupting him, keep him on his toes, and never let him digress from the questions. Unfortunately enough, that's exactly what Nixon does during the first two interviews. He journeys off into long anecdotes about his life that take up most of the interview time. Jack Brennan (Kevin Bacon) is the one on the other side of the defense, prepping Nixon. He gets nervous, however, with the approach of the third interview because it contains the hot topic of the Watergate scandal. And just as Frost's team is losing all hope, Frost goes ahead and nails a killer of an ending and receives the outcome we already know in advance. Nixon solemnly states, "I let down the American people." Michael Sheen and Frank Langella reprise their same roles from the original play, and they embody these real-life men ideally. Both of these actors deserve nominations for their work. Langella, especially, presents a psychological investigation of Nixon who turns out to be quite a limited and sad figure. Sheen's interpretation of Frost is of a much brighter notion but contains the same level of complexity. He's a man not knocked down by rejection even while well knowing he's putting his entire job and fortune on the line with these interviews. There's an entirely fictionalized but ultimately very affecting scene where a slurred and drunken Nixon calls Frost at his hotel late one night. It's this scene that transforms "Frost/Nixon" from mere documentary to powerful human drama. Langella here is bone-chilling and fantastic. We are shown the core of a man that could never be seen from just TV interviews alone. The scene captures the essence of the stark contrast between Nixon and Frost. Nixon unknowingly sets the stakes even higher than they already were, stating that they are both striving for the limelight. Frost then reminds Nixon that, in the end, there is only one winner. The next morning, Nixon doesn't even remember the phone call, but Frost sure does. We remember, as well, what Frost represents for Nixon. He is a showcase for Nixon's weak points, and even in some cases, his deepest desires in life.